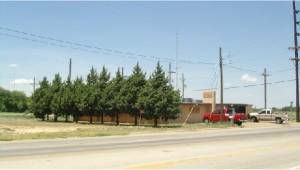 On the outskirts of Lubbock, on Martin Luther King jr. Blvd., stands a low building. It still houses a radio station and in 1953 it was home to radio KDAV. On Sunday afternoons Buddy Holley and Jack Neal played country songs together on the air. People could request songs and they would play them. It was a second home to Buddy, he hung out there all the time. It was here that Buddy first heard Elvis sing “That’s all right”. DJ Hipockets Duncan became his friend and manager. In those early days of local fame, Buddy and Jack performed in a rowdy barnlike venue called “16th and J”, where Jerry Allison was also playing at the time in a band named the “Riverside Ranch Hands”. Buddy and Jack even did their thing together on a local tv show, hosted by Jack Huddle. Buddy would record with Jack Huddle in Clovis in 1957. In October or November 1953 (acetate dated November 10, 1953) Buddy and Jack recorded two songs at KDAV: “I Saw The Moon Cry Last Night” and “I Hear The Lord Callin' For Me”. Both sung by Jack with Buddy playing the guitar. A couple of months later Bob Montgomery and Don Guess joined Buddy and Jack on the air at KDAV and called themselves the “580 Ranch Hands”. 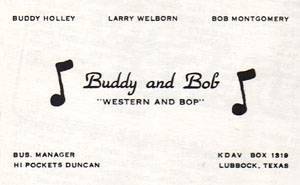 Buddy and Bob used the address of KDAV on their “Western and Bop”-business cards. Larry Welborn joined the bunch and some more record ings were made at KDAV: “You And I Are Through”, “Baby It’s Love”, “Memories”, “Queen Of The Ballroom”. 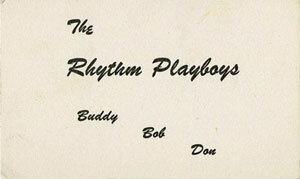 The whole troupe toured around as “Don Guess & the Rhythm Playboys” in a Packard hearse! In late 1954 Jack Neal quit to get married and Sonny Curtis soon joined. They continued playing on Sunday afternoons until late 1955, when Buddy got the offer from Decca. KDAV DJ Ben Hall was a big influence on Buddy and wrote “Blue Days Black Nights”. Recorded by Ben himself, but in 1956 it was Buddy’s first single release. 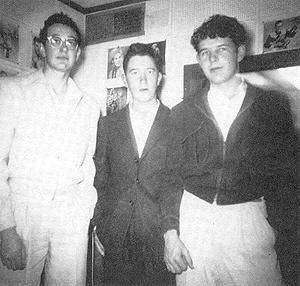 Buddy Holly made two more recordings at KDAV, with Gary Tollett, on February 21st 1957.